WASHINGTON -- A little more than 24 hours before President Barack Obama hosts his final White House state dinner, for Italy's prime minister, guest and celebrity chef Mario Batali appeared as cool as the sweet potato puree that will be stuffed inside of hundreds of pasta pockets and turned into a ravioli appetizer. After all, Batali said he's prepared meals for crowds as large as 7,000 people. So then dinner for 400 in a tent on the South Lawn should be a piece of cake, right? "My only worry is, logistically, I really like hot plates and hot food," Batali said Monday at the White House, where he and four chefs who accompanied him from New York had already started prepping ingredients. In an attempt to soothe his concerns, he said the White House had "shown me an alarming number of hot boxes" to keep the meal, well, hot. "They assured me that even though the kitchen is 200 yards from where we're going to plate it, that they have it all covered. And I look at them and I understand their experience. I'm not that worried," Batali said, before adding: "If there's one thing that I'm not going to sleep well about tonight, it's only going to be the hot plate." Cold dinner at the White House? Say it won't be so. After the ravioli course is served Tuesday, guests will dine on a roasted butternut squash salad before slicing into pinwheels of beef, a classic Italian dish that the White House is putting its spin on by using American Wagyu beef instead. Dessert is a green apple crostata, or Italian tart, served with buttermilk gelato, or Italian ice cream. Grammy Award-winning singer Gwen Stefani, co-founder and lead vocalist of the band No Doubt, will perform after dinner. 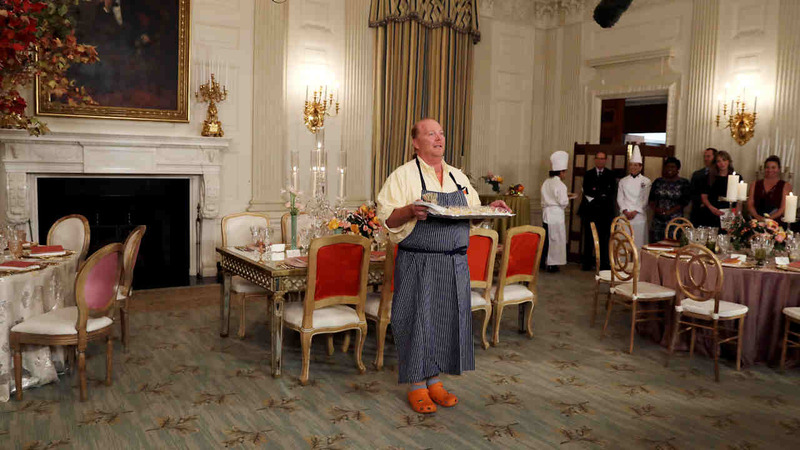 Batali, who sported his trademark ponytail and ever-present orange Crocs as White House officials previewed the menu and decor for Obama's 13th and final state dinner, said he collaborated on all four courses with executive chef Cristeta Comerford and pastry chef Susie Morrison and their teams. Regarded as an expert on Italian cuisine, Batali said he wasn't as worried about serving Obama and his wife, Michelle, as he was about serving Prime Minister Matteo Renzi and his wife, Agnese Landini. "You generally don't worry that much about Americans when you're cooking pasta. You're worried about the Italians," the chef said. A restaurateur, cookbook author and a host of the ABC daytime, cooking show "The Chew," Batali isn't the first guest chef to apply his culinary know-how to a White House state dinner. In 2009, Obama's first year in office, celebrity chef Marcus Samuelsson helped prepare the state dinner for India. The following year, the Obamas invited their friend and chef Rick Bayless, a seasoned authority on Mexican cooking, to help when Mexico was being feted. Batali said he was at his Michigan home at the end of the summer when the White House called to offer him the gig. "I said 'Absolutely, I'll do it,'" he said. "There's no other call that I could imagine that could be as good because you know when you're going to have a baby and you know when you're going to get married, so that was about as good as it could be." And the Crocs stay on for dinner, Batali said.